Hi friends... in this era of high tech gadgets, I wonder how many of you are old school like me and still use a pen and paper to make shopping lists and to do lists! I was heavily inspired by some of my favorite Challenges to make all the elements in this project. I altered the backside of a desktop calendar into a pretty note-holder for my kitchen! 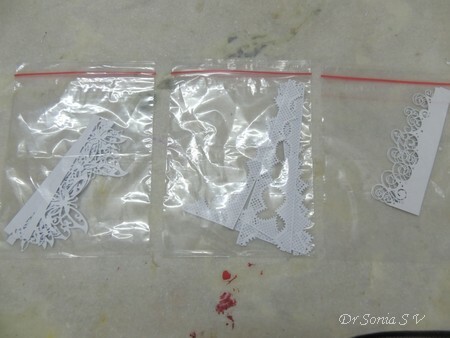 A crafter recently asked [on facebook] about what can be done with paper scraps. I used to hoard scraps earlier but over time it grew ,took too much space and became rather overwhelming. So now I dont let it grow too much. I keep a tray with scraps right on my craft table near my die cutting machine and whenever I am in the mood, I die cut favorite shapes from the scraps of leftover paper. 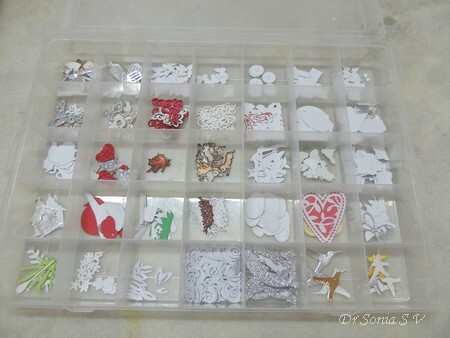 I try to arrange my most used tiny die cuts in clear storage boxes or transparent plastic covers so that I can save time in a future project. I carefully store even tiny scraps of specialty card stocks like silver card stock as not only are they expensive but are not easily available in my area. Tiny bits of silver and kraft card came in so handy to make my kitchen utensils! 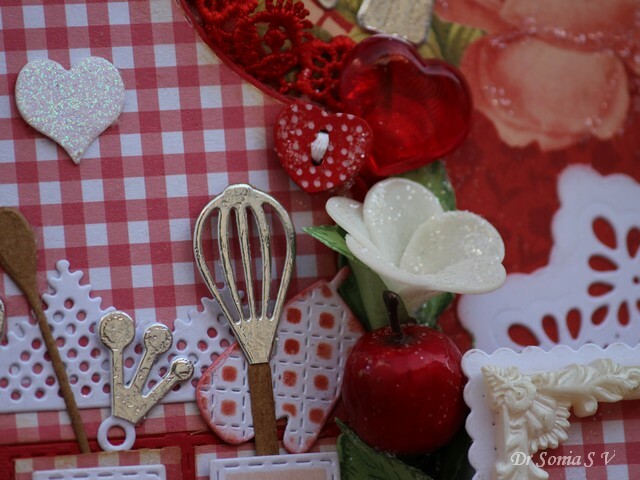 Not only does my kitchen actually have a red color scheme but I think I am being influenced by cupid and the valentine month to use a red color theme with roses and hearts galore! 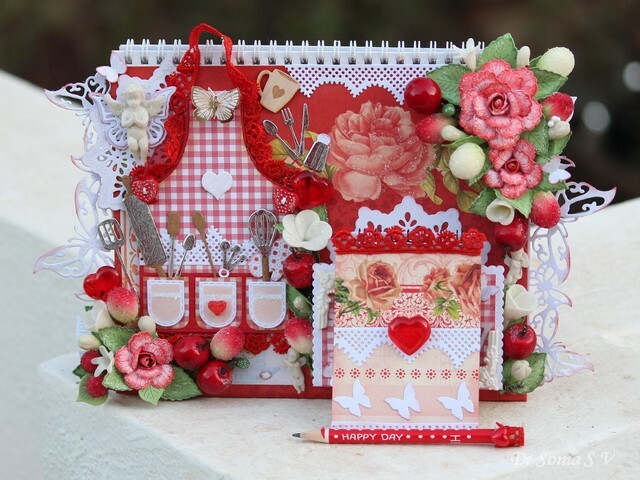 The red rose is handmade using Heartfelt creations stamps and dies. The white flowers and buds you can see peeking from behind the rose were made with air drying "Thai clay"
The lovely shimmer you see on the thai clay plumeria and the paper flowers was achieved using "sparkling dust" glitter. In the closeup below you can see the super cute kitchen glove made with the fine stitch lines and check pattern! Also couldnt resist adding a wooden cup with an engraved heart! 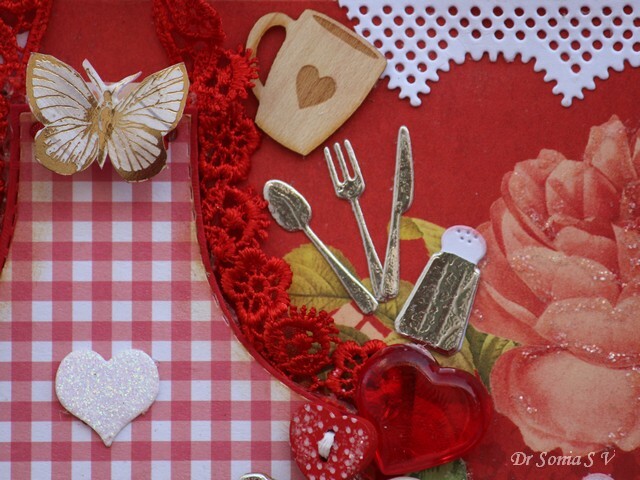 And can you spot the cute shiny red hearts scattered all over my project....! The cute heart buttons are from my friend Mia! 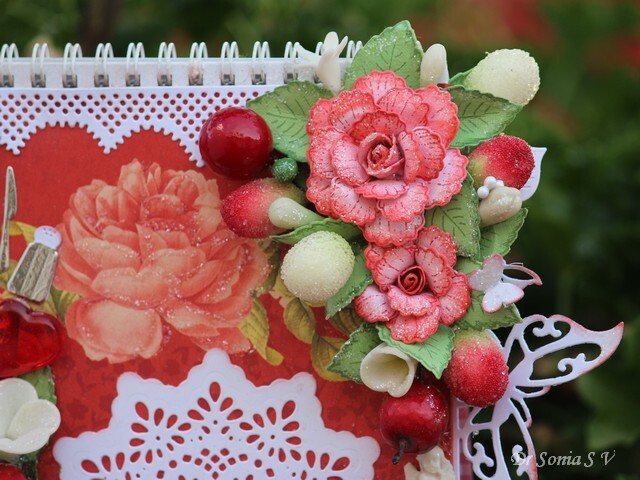 This corner has handmade paper roses , Thai clay flower buds and lots of cute berries and a cherry! The note holder has a "Happy" with a beautiful shiny surface made by heat embossing Winnie and Walter Happy die cut with clear UTEE. 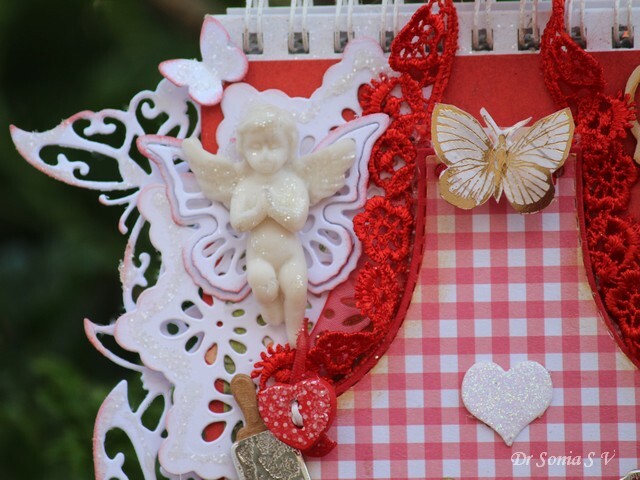 The little angel is again a handmade embellishment. 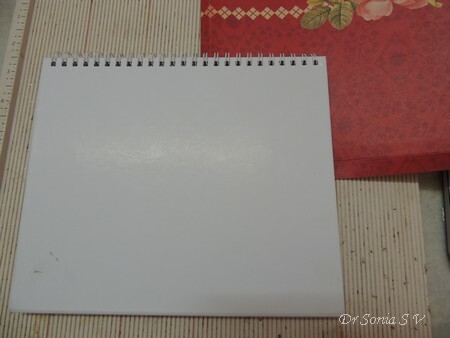 And here is the notebook with matching papers and a cute heart! 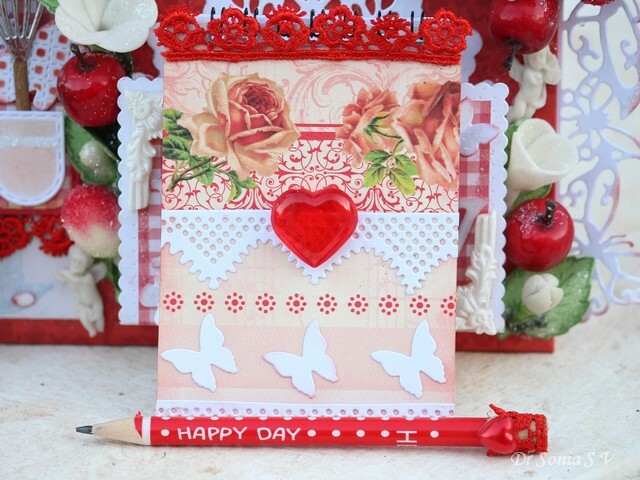 I even found a matching pencil with " Happy Day" printed on it and dressed it up with red lace and a shiny red heart! Hope you liked my kitchen note holder! WOW! This is AMAZING and GORGEOUS! 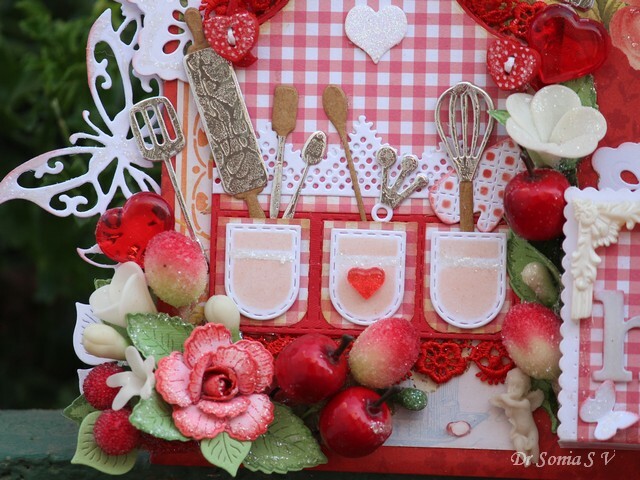 I love all the elements on this project ... so many wonderful kitchen items and your flowers/fruit are FABULOUS! I love this idea and you've done an amazing job! Thanks SO MUCH for joining in the fun at our Double D ‘Kitchen is Where the Heart Is’ challenge! Good Luck and we hope you’ll come back often. This is fantastic - what a beautiful gift idea. 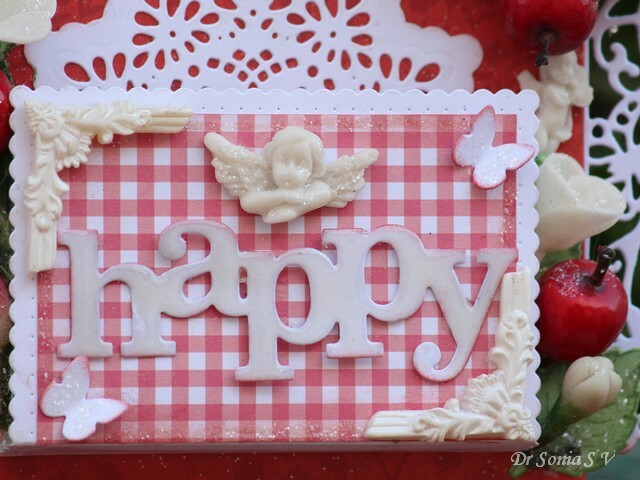 All the detailed embellishments are so clever, from your metal and wooden tools and the shimmery berries and flowers to the gorgeous molded flowers and angels. Just so amazing! This is gorgeous Sonia. 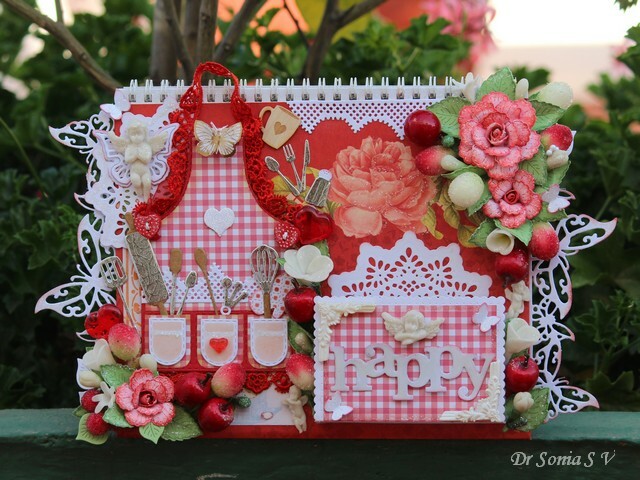 lots of gorgeous details and your gingham papers are perfect - a brilliant way to use your old calendar. Like the pretty detail. The utensils as wonderful. Not old school on shopping lists or to do lists. I use the Memo app & the Kroger grocery app on my phone. Gorgeous project! It will be beautiful in your kitchen! We use lists here as well but nothing as elaborate and beautiful as this! Enjoy! I'm still here, looking at all the photos again. 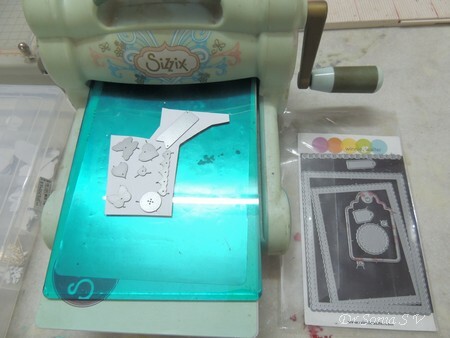 This really is an awesome project and I am intrigued with how you organize your die-cuts. I've recently started something similar, but I'm not nearly as organized as you are. Thank you for inspiring! Wow, wow and more wow. This is fabulous and I make it 5 of the elements used. Butterflies/checks/crimson/cream/corners. Thankyou for spinning the butterfly wheel with me this week. Hugs Mrs A. Wonderful sonia..I can still little details after scrolling backwards and forwards looking at all your photos..so many wonderful happy things on this project, I love it. Oh my goodness! This is gorgeous! I love all the details you put into this piece! Thank you for sharing with us at Scrapy Land Challenges! This is a fabulous Kitchen project. I can see how handy this will be as well as fit into the decorating theme you described for your kitchen! Pinned immediately your amazing creation! I'm lost for words, this is just SO amazing! Really, really stunning. Stunning creations. Love how you combined all the elements on this projects. Great idea to cut and store your die cuts. Have a great day. 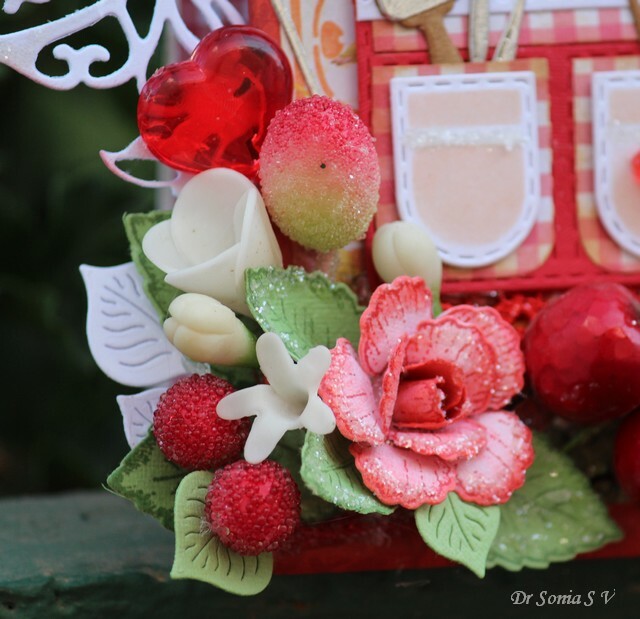 What a stunning project Sonia, it will make a wonderful gift. a great way to keep all of your die cuts organised and ready to use. Great work as always and this one looks like a real labour of love but worth every moment. A wonderful job !!! Cute details and colors !! You have taken so much effort for putting such gorgeous details. It is so beautiful and amazing project. Hehe my daughter told me the same thing exclaiming that it was too pretty to keep in our kitchen and risk getting it dirty!! WOW! that is absolutely stunning. Love all the little details. It's just amazing. I live and die by my lists! lol Just checked off--water plants! lol This is GLORIOUS! I love all of your layers and all of your beautiful accents! WOW! So much to look at and enjoy! 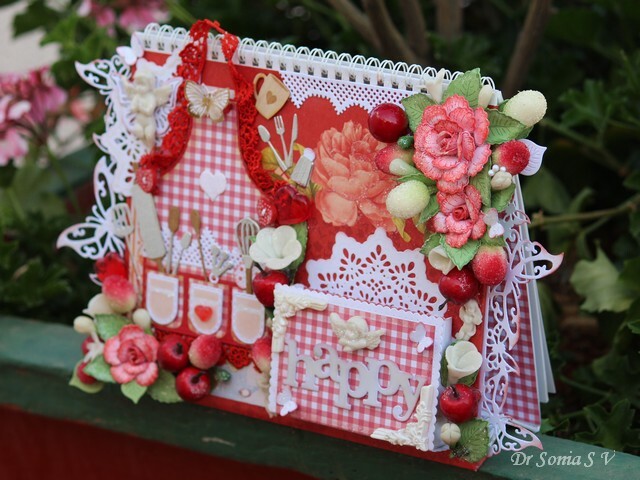 Thanks so much for playing along with us at The Double D Challenge Blog, Kitchen Is The Heart Of The Home Challenge, Donna, DT Member. Good to hear you are like me...I have so many lists and just feel lost without them!! This is AWESOME! What a great idea! LOVING the apron and the little utensils!!!!!!!!!!!!! Wow!!! This is just amazing and so pretty too. What a fabulous piece of art to have in your kitchen and useful too. So much detail and work has gone in to this, it's fabulous. Beautiful! So much details. Beautiful flowers, adorable utensils. LWhat a inspiring way to keep your list. Love it. Good idea with the leftover paper pieces. I have to get rid of mine as well. Wow, Sonia! Your creation is just perfect. I am so glad that you use so many pretty goodies. 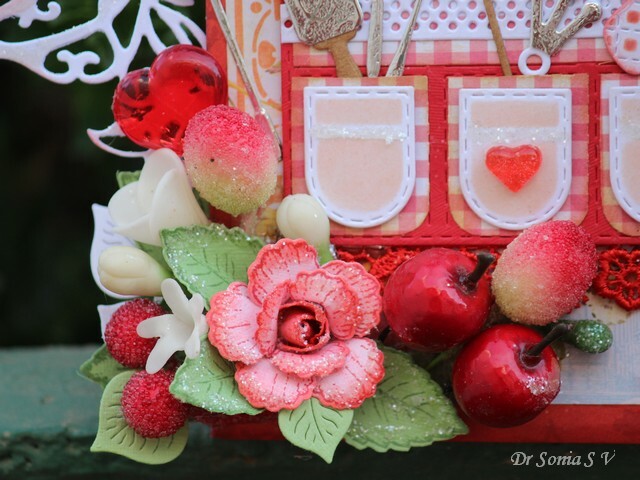 The heart buttons are beautiful in this great kitchen note holder. You always inspire me, my friend. Kisses!!! Wow! This is just gorgeous I love the pocket holders with the utensils in it . I am like you I have to make a list on paper . WOW Sonia!! What a fabulous idea...I love the design and fabulous embellishments! Wow! This is amazing! The apron is gorgeous. The tiny kitchen gadgets are lovely. I love how you've organized the die cuts. Such a beautiful work of art, Sonia. You never fail to surprise us. The colours here are awesome - so well co-ordinated and so very charming. LOVE IT. How adorable! That gingham pattern is perfect for the kitchen theme. LOVE the use of red! Wow! So beautiful!! I just love all the amazing details you put into this stunning project!!! Gorgeous work! HUGE gasp from the Playground - Sonia, this is utterly fabulous! So much wonderful detail and a fascinating post about how you manage your snippets and little die cuts! I'm totally in awe of your note holder, quite the prettiest kitchen inspired piece of work I think I've ever seen. Love it! Back again Sonia!! I get to take another peek at this beauty!! Thank you for sharing with us at Fussy and Fancy! This is super sweet! Such a great design! So adorable!! Trying to scrape my jaw up off the floor. Amazing!!!! So detailed. And yes I do still do my lists old school with pencil and paper. LOL Hugs! Wonderful project. Yep, I'm a pen and paper shopping list person. Great tip for your scraps of paper. Each time I visit Sonia I'm blown away with your creativity and beautiful ideas and work. This is amazing, so many incredible and so beautiful elements. FABULOUS. Awesome!! Very creative! love the small small elements you added. Oh my goodness! Sonia, this is one of my favorite projects of yours... I have a heart for baking and this just whisked me away into the kitchen. The colors and endless details are truly inspired. You continue to be such a gift to the crafty community. Thank you for inspiring us so richly. :) Have a beautiful day, friend. Wow this is just adorable ! Love your handmade embelishments ! wow- this is amazing, so many wonderful details to look at. Congrats on your gold star from Miss Di. congrats on your gold award on the snippets playground. Your creation is so stunning and very superbly created. Lots pf crafty love. Jenny L.